Fair prices, quick production, professional shipping and produced a quality product. I have used this company 2 times for newsletters and I am very pleased. The product is second-to-none, the staff is knowledgeable, friendly, and they ship so quickly!!!! I used this company on a whim last year, and with the quality of the products, my entire department will be switching over to their company by the end of the year. Thank you for making my job so easy!!!! Excellent service from start to finish. The contacted me with questions about my order and worked with me to be sure everything was just right. I'm very happy that I went with Printingcenterusa.com for our newsletter, and will be very happy to work with them again. Everything was great. It was timely and the printing was very crisp and clean. After submitting my order, I saw a problem with my file and uploaded a replacement page. I was very happy to be able to call an actual HUMAN to make sure that everything was as expected. My additional upload caused a bit of a kink in the usual operations, but Tom contacted me to make sure that everything moved through smoothly. I was very happy to get my newsletters in hand, looking EXACTLY like the proofs. A+ service--I am thrilled with the results! Great Choice! We were looking for an economical way to get our initial church newsletter printed in all color. The price was right and the final product was far better than we expected. Process was simple and they made sure we liked the proof before sending to production. We will use Printingcenterusa.com again! You did a GREAT job printing my newsetter! Thanks for checking it over and offering suggestions. I will definitely recommend your services and use your company in the future. Not only am I impressed with the final product, but I am overwhelmingly impressed by the customer service, friendliness of the staff, and the way that they handle their business. I am not only a customer for life now, but I am also already planning my next purchase through this company, and have professed my love of the company to my entire school district!!! Thanks for making my life a million times easier this year! Our newsletter looks fantastic, especially with our mistake corrected. Thanks for being so easy to work with! From start to finish the printing process was a smooth and comfortable one, with a great final product! Couldn't be happier with the price, speed of production, and quality! Thanks for a seamless and joyous experience! Definitely will be using in the future!! Printing USA comes through each time I order. If there is an issue they fix it. That is what good companies do. Thank you for always taking care of us. First time I have used this company. They did a great job and the finished product was perfect. Moving from a very urban environment to a very, very rural area, the newsletter came exactly as I expected. The organization was extremely pleased with the professional representation of them due to the quality of the paper and the folding of it. Thank you for the great job you did and I will definitely use you again. The order process is very easy. The newsletter was produced quickly and with good quality. Communications are good. Customer service is responsive. Friendly and helpful customer service. Exceptional finished product, great value. In the last year this company has went downhill in both customer service and the increasing prices. Their product quality is outstanding. But their prices have increased about 30 percent in the last year and their customer service has decreased by that much if not more. The last order I placed will most likely be the last. I talked to the manager Kevin about some of the issues and his statements were: 1-They no longer want the smaller orders so they have tried to out price those customers and 2-He will not deal with a customers order more then a few days-and I have an email from him confirming this-that he will wash his hands of that customer after a few days of emailing or talking on the phone. I called and talked to the President and owner of the company and even got on a three way call with him and Keven. The owner seemed very nice and seemed to honestly want to know about issues-which I believe had never been brought to his attention. The owner stated he actually does want to get the smaller jobs back but that they are so busy they can not handle them right now. As a business person I have witnessed many great businesses go down hill and shut down very quickly with a manager like this company has in Kevin. As long as he runs the company with the same attitude he has had over the last year this company will not be around long. My issues were resolved but only after several calls and demanding to talk directly to the President of the company. Many people will not do this and just stop ordering and go to a different company for what they need. My suggestion for anyone wanting to order something from this company is this: If you want amazing quality printed products,don't care about the price and know exactly what you want then YES you should order from this company. If you are concerned about the price and/or do not know exactly what you want or need then NO do not order from this company. I don't think I could say enough kind words about this company. I blindly picked them after searching for an hour for different printers. My client had a tight budget and I needed top quality at the same time. I ordered. They delivered on time. I opened the box with my fingers crossed hoping I wasn't getting some cheap copy prints. Pulled out the printed newsletter and was astonished with the quality. I WILL be ordering future printing from these guys... So if you have doubts. Throw them out the window because they have great customer service as well. Thank you Printing Center USA! I always get great service from Printing Center USA. They are speedy and professional. Print 11 x 17 four page or create 8½ x 11 and 5½ x 8½ multi-page newsletters starting at 8, 12 16...64 pages, including cover. You can order short run quantities from 10 to 3,000 on 100# gloss or matte text (Self Cover) or add 80# cover paper. Take the hassle out of printing and mailing your monthly newsletter. 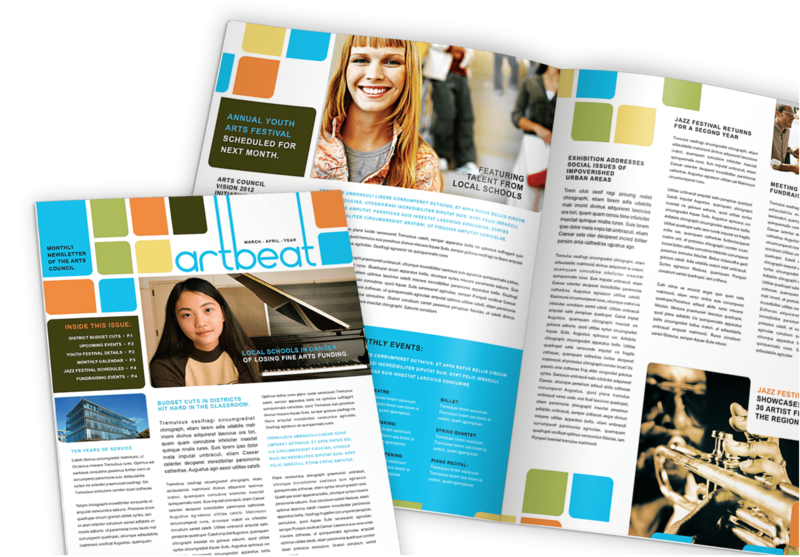 We print quality color newsletters at affordable prices for businesses, organizations and educational institutions nationwide. Add mailing services and we'll save you even more time and money. Our inexpensive professional quality newsletters are created using the best inks, papers and printers to generate the finest quality within your time frame. We print affordable newsletters that may garner higher response rates and are a beneficial marketing piece for any advertising campaign. Upload your own print-ready files or if you need help, use our free predesigned blank templates. Submit, proof and we'll print and mail your newsletter in as little as 4 days. Fast, easy ordering online or call 800-995-1555. Create 8½ x 11 tri-fold or 11 x 17 half fold newsletter with our online photo design tool.Choose which Online Design Tool you'd like to use according to you newsletter style.